Apple took to the stage at the new Steve Jobs Theater today and announced a few new devices. These include the latest lineup of iPhones with the iPhone 8, iPhone 8 Plus, and iPhone X. 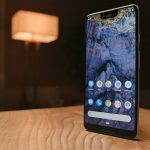 We have already compared these devices to the powerhouses of the Android market, but how many of these self-proclaimed revolutionary features have been around on Android for awhile? 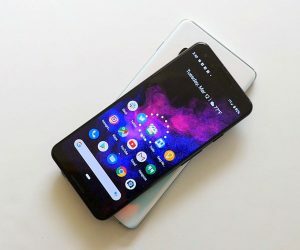 (Spoiler: Lots) Here are 8 features that Apple stole from Android with the iPhone X.
Wireless charging has FINALLY arrived on the iPhone 8, 8 Plus, and iPhone X. However, this has been a longstanding feature in Android devices, dating back to 2011 with the LG Revolution. Since then we have seen Qi wireless charging in an array of devices including many that have already launched in 2017. 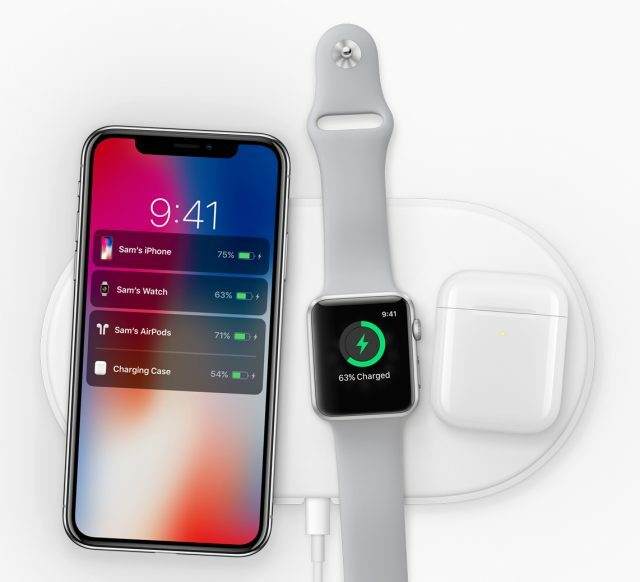 Before the announcement was made official, there was concern that Apple would be opting for some proprietary wireless charging system that would end up leaving Android users in the dark as wireless charging is expected to expand. Luckily, that isn’t the case and Apple included the Qi charging standard in its latest lineup of iPhones (this should actually help Android users). The biggest reason for the exclusion of wireless charging has been Apple’s decision to move to an aluminum (or aluminium) unibody design ever since the iPhone 5. 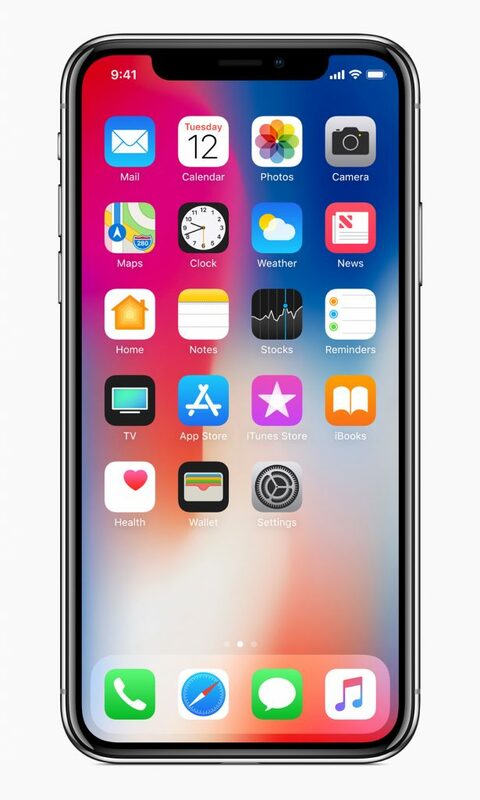 This has changed with the current generation iPhones, as each model features a glass front and back, with the metal frame sandwiched in between. 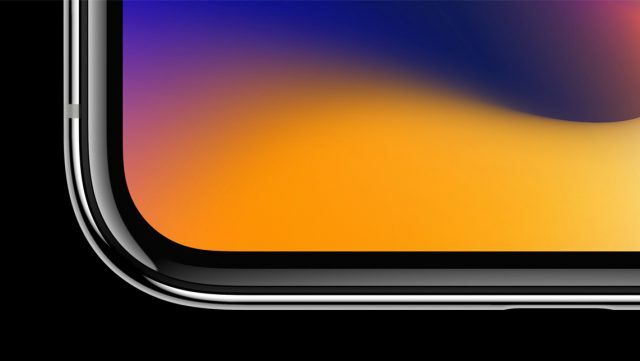 This one doesn’t date as far back as Qi wireless charging, but the iPhone X now features a bezel-less display, which accompanies an all-new design. This movement was started way back with the Sharp Aquos a few years back, gaining further momentum and popularity after the Xiaomi Mi Mix was announced last year. Since the launch of the Mi Mix, we have seen LG, Samsung, and a few other OEM’s turn to this design as it offers more screen real-estate for users, without making the device too large to handle. We’ll get more into the display type later, but the iPhone X’s display measures in at 5.8-inches, but fits into a frame that is wedged between the standard 4.7-inch iPhone 8, and the rather large 5.5-inch iPhone 8 Plus. 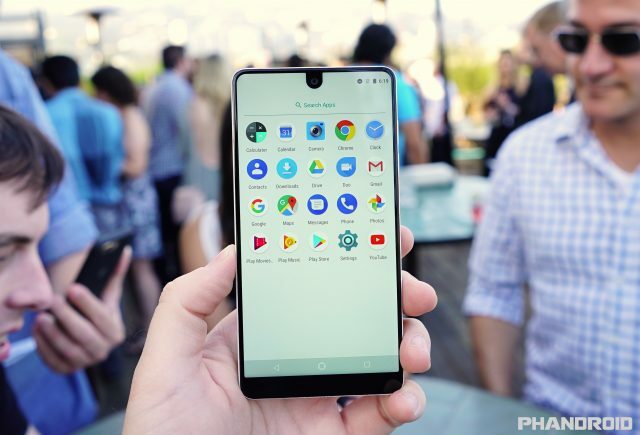 Oh, and as for that notch in the top of the display, we’ve already seen that too as the Essential Phone (which is finally here) was the first to debut with the notch. This cut out in the display houses many of Apple’s sensors, including the front-facing camera, however, it’s definitely bulky considering the Essential Phone’s notch only houses the front-facing camera. Going back to the theme of long-standing Android features that have finally arrived on Apple products, facial recognition has arrived. 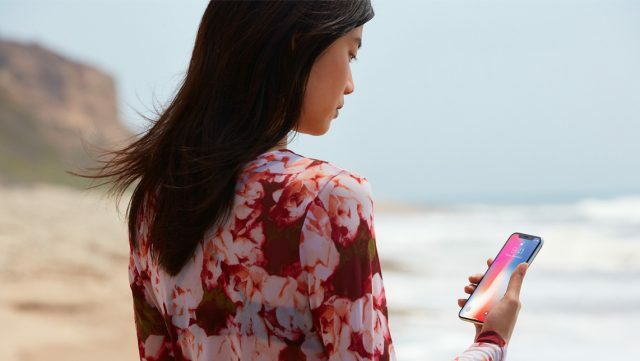 Dubbed “Face ID”, Apple claims that you no longer need a fingerprint scanner as you can use the built-in facial recognition software to quickly, and securely unlock your device with ease. Unfortunately for Craig Federighi of Apple, this wasn’t the case as the first two attempts to demonstrate this function promptly failed, forcing Craig to use another testing device on stage. 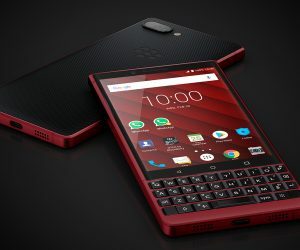 As for where this lands in the history of Android? You’ll have to go all the way back to the Ice Cream Sandwich days with the Samsung Galaxy Nexus. 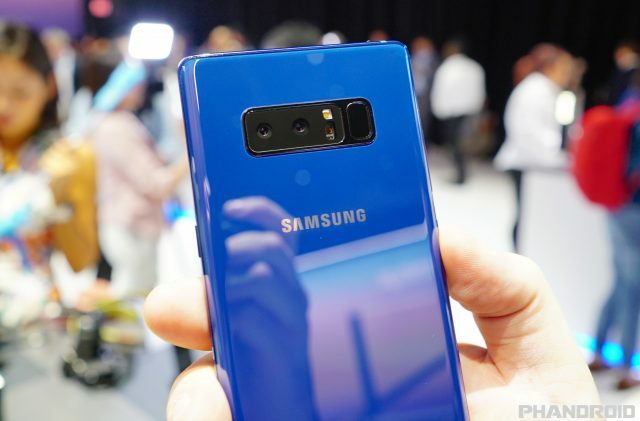 Since then, the feature has been revamped and improved and has even evolved to the point where Samsung is including Iris Scanning functionality on its latest devices. 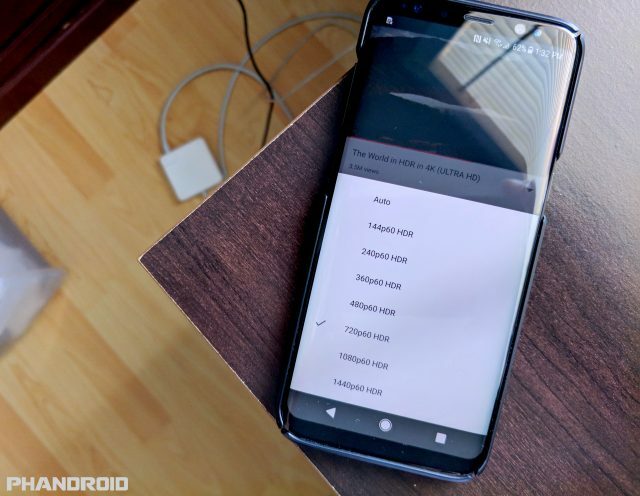 Regardless, our own Joe Fedewa currently has the LG V30 and states that there is no way that the iPhone X will unlock faster than the V30 is capable of. With the iPhone X, Apple included the dual Optical Image Stabilization in its rear cameras for the first time. However, Samsung beat Apple to the punch just last month with the announcement of the Samsung Galaxy Note 8. 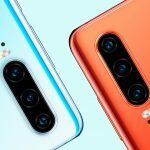 Considering that Samsung and Apple are always touted as the top two options for cameras in smartphones, this comes as no surprise that both companies were working on this functionality. However, Samsung took some pretty big swings at Apple’s lack of OIS for video recording and compared the 7 Plus to the cameras found on the Note 8. Now that we’ll have two devices capable of dual OIS cameras, only time will tell who’s the real winner here. 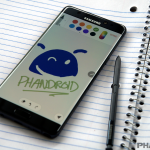 Be sure to check out more in our Galaxy Note 8 Forums. 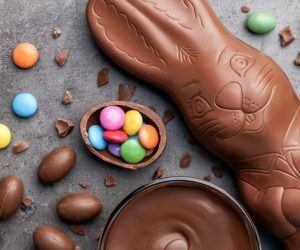 Battery life is probably the biggest complaint when it comes to just about any device, and with the creation of Quick Charge, you can now quick charge your phone to keep you going through the day without much issue. However, for iPhone owners, this option has never been available, unless you plugged your phone into the larger iPad charger. 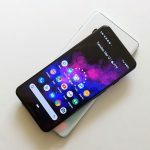 Qualcomm debuted Quick Charge 1.0 all the way back in February of 2013, with the promise that your phones would be able to charge “up to 40% faster than older phones”. 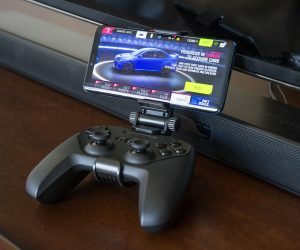 Over the years this has evolved, and we are seeing other OEM’s such as OnePlus (Dash Charge) and Motorola (Turbo Power) develop its own quick charging technologies. Enter the iPhone in 2017. 4 years is a long time to wait for fast charging, but the iPhone 8, 8 Plus, and X all now feature fast charging capabilities. While not many specifics are known just yet, Apple is claiming that each of its latest iPhones will be able to get up to a 50% charge in just 30 minutes. Pretty impressive for Apple standards, but that is the norm for many Android owners nowadays. This is a rather big one if you really care about the different display types, but prior to 2017, Apple had been using LCD display panels in its devices, and even includes LCD panels on the iPhone 8 and 8 Plus. However, that changes with the iPhone X as this is the first Apple device to launch with an OLED panel. Apple isn’t the first OEM this year to make the switch to OLED as we saw LG do the same with the LG V30. 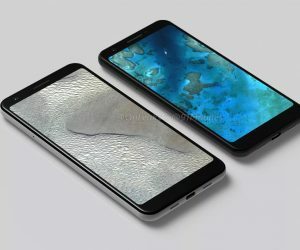 Regardless, both companies are just playing catch up at this point, considering the fact that the first OLED smartphone launched with the Samsung Galaxy. 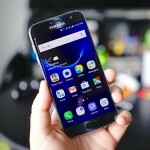 When did the OG Samsung Galaxy device launch? 2009. It’s only been 8 years, but Apple’s finally in the game. Going along with the switch to OLED display panels, the iPhone X is now HDR certified, meaning you can view some of the best content from the likes of Amazon and Netflix in glorious HDR. However, as you would expect, Apple was not the first to do so, as the LG G6 launched earlier this year with the ability to view HDR content from Netflix. This space is only going to grow in the coming months/years, and we can expect even more devices to become HDR-certified in 2018. At least Apple’s jumping on this train rather early, instead of waiting until the market is saturated to the point that it doesn’t matter. 1st phone designed for Augmented Reality (LOL)? One key quote mentioned during today’s Apple keynote was that the iPhone X was “the first smartphone designed for Augmented Reality”. As we here at Phandroid watched the keynote, we couldn’t help but laugh out loud at that statement. While AR Kit does seem to be rather interesting and a game changer for AR, the iPhone X is far from the first device to be “designed for AR”. 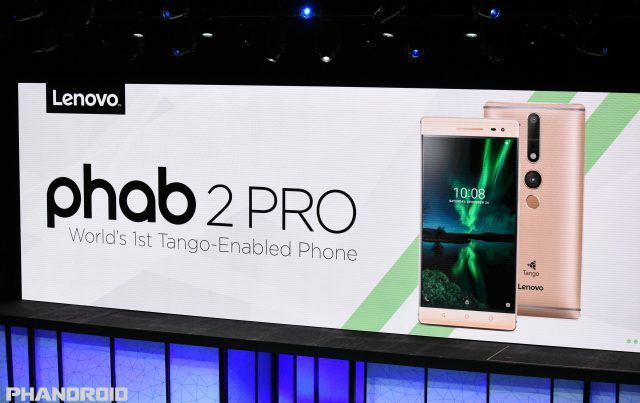 That distinction belongs to the Lenovo PHAB 2 Pro was launched last year and provided access to Google’s Tango AR capabilities (now dubbed ARCore). Then, we saw the ASUS ZenFone AR announced which not only included Augmented Reality but also support for Google’s Daydream VR technology. Sorry, Apple, you weren’t the first to do this one, but you might want to do some research before making ridiculous claims. 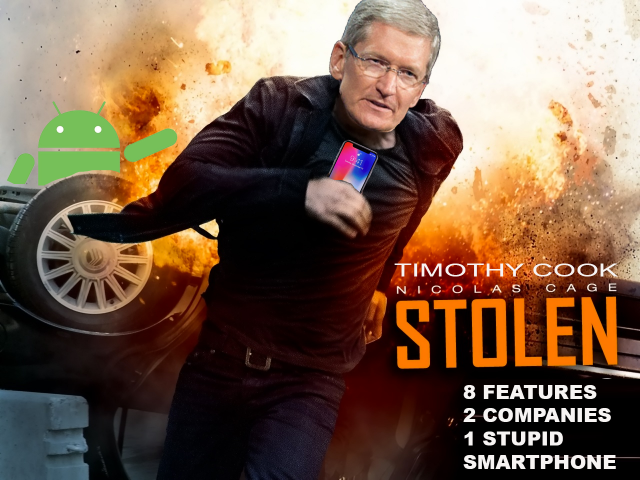 Can you name other “revolutionary” iPhone features that Apple has “stolen” from Android in the past? What do you think they’ll steal next? Let us know in the comments!